I have been asked several times how I create out of frame images. I understand there are many ways to achieve the effect. This is the way I do it. Excellnt Ture Lyn!...I have used that foto frame before, albeit a long time ago! Thanks for this tutorial Lyn. 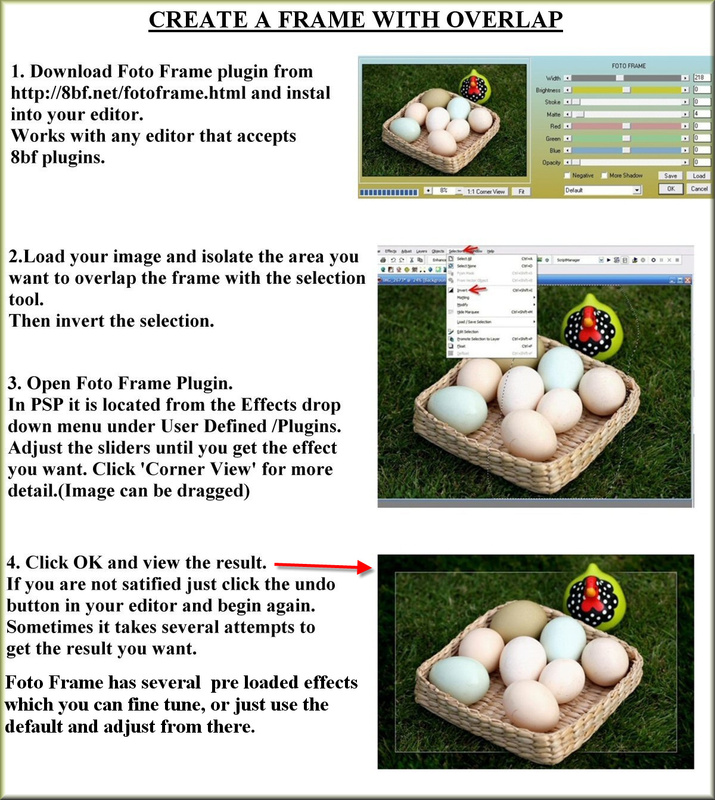 I've already downloaded the free 8bf.net (fotoframe.zip) plugin, and have saved your tutorial. Will give it a try soon. To me you've done a great job! Thanks Lyn. Not sure if it will work with my editor or not but sure hope so!! Well now. This sure beats dealing with 'marching ants" in Photoshop! Expect lots of OOB images now! You did a really fine job of setting up this tutorial. RON PAUL RON PAUL RON PAUL Pro-Constitution. Thanks Lyn. I plan to give it a try! Thanks for sharing this technique with everyone, Lyn, as well as the fruits of your labor. What you won't be able to share, however, is your ability with the camera itself (that only comes to the individual with time and perseverance). That and the beautiful New Zealand landscape. Happy holidays! It looks like a good tute that I must try LE. Glad to see you didn't put all your eggs in one basket. Great tutorial. I'll bet it's a PC program. Yes, sorry Jen - Windows only. Thanks,,,tried what you've showed but it doesn't yet look as good as yours...maybe with a little time & practice. Thank you Eve.I have PSP,i think i give it a try. Thanks you so much for taking the time to post this. I was just going through the permanent galleries and found this tutorial. I am thinking of trying an overlap frame soon, so thank you for your help and advice. Fav'd for future reference!